Moist and fluffy vanilla cupcakes piped with brown sugar buttercream frosting and drizzled with homemade caramel sauce. There are simple tricks to getting a moist and fluffy vanilla cupcake. Adding egg whites instead of the whole egg creates a fluffier texture. By using a whole egg, it creates a richer and denser cupcake. Using egg whites also makes a whiter cupcake. Overbeating the cupcake mixture creates a denser cupcake that isn’t light or airy. I use a hand mixer on low to incorporate my ingredients without overbeating. If you would like to use whole eggs in this recipe, you certainly can. Add 2 whole eggs instead of 3 egg whites. This will create a more velvety texture and make it a little heavier. Making brown sugar frosting isn’t all that different from making regular buttercream frosting. Because brown sugar is grainy, it needs to beat into the butter at the beginning to allow the sugars to break down. This will help reduce the grainy texture in the brown sugar buttercream frosting. 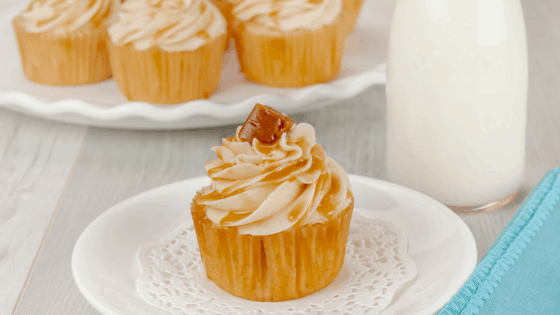 These vanilla cupcakes are topped with a homemade caramel sauce. This caramel sauce doesn’t harden and isn’t hard to chew. It’s very pliable, soft, and smooth. It’s really simple to make, too! I use a small saucepan to melt the butter and brown sugar together and then I just add in the last of the ingredients. I bring the sauce to a low boil and then allow it thicken for a minute or two. After removing it from the heat, it is important to stir and then allow it to cool before piping it onto the brown sugar buttercream frosting. This will prevent the frosting from melting and it will allow the caramel to be thicker and flow nicer to decorate the cupcakes. Moist and fluffy vanilla cupcakes piped with brown sugar buttercream frosting and drizzled with homemade caramel. Beat in the brown sugar until combined well and smooth. Stir in brown sugar and stir constantly to break down the brown sugar. Turn the heat up to medium, keep stirring until it starts a low boil. Stir for another minute or two and remove from heat. Allow caramel sauce to cool before piping onto the frosting. If desired, top with soft caramel candies. Yummmm! Making these this week! These look amazing! !